Ojo's World: It will get easier??? I am ridiculously tired today. I barely had 2 hours last night. My son will not stay in ANY room on his own, at the moment. It could be a phase, but being autistic, this phase could last ages. It's been several months now. He actually shares his bedroom with his 10 year old brother, but they have bunk beds. This means, when little A wakes during the night, he can't see RJ, so he panics. This sends him running to our bedroom or, sometimes if I'm not quick enough, his teen brothers bedroom. To top it off, he has been unwell this week, so he has been home everyday. This basically means he is with me where ever I go. I know most parents can't go to the loo alone, but my son is nearly 6 now. It's not even the going alone, it's the out right panic it causes him, if he thinks he's been left alone! In my opinion, he is finally well enough to go back to school tomorrow, so I was planning plenty of rest, for me...........Now I have discovered a mysterious rash under the 10 year old's arm?! It looks nasty, and I can't risk sending him to school tomorrow. Oh and I decided to take a trip to the local town Xmas fair today, I knew it would be hard for little A. My mum took RJ (I didn't know about the rash at the time). So it was me, the mister, the little one and the big one............it was stressful! He doesn't cope, so we couldn't really enjoy. I got to see some things, but not a really good look. 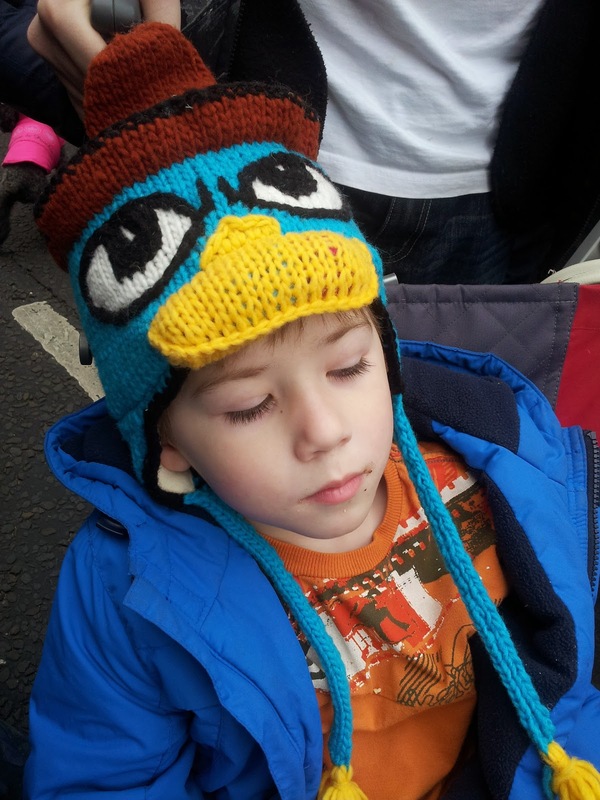 Little A in his £10 Perry the platypus hat!! It also cost me a fortune! I do give in, in the hope of keeping him occupied and distracted. It only works for so long though. I really need to hear that today.